Here is my rd3 game. There was plenty of exitement in the game. I missed easy moves and hard moves and in the end I just could not win the game. The position seems rather quiet. What do you suggest for black? Black has a big attack going and a nice target with Ke2 in the middle of the board. How should black continue? Black’s king is running for his life. What should black do? Here is my rd 5 game. This game was packed full of tension, drama and mistakes. The game was finally decided late in the game with a time trouble blunder. Early in the game white has achieved an original position with Qd3. How should black play? Black has a beautiful good knight vs, bad bishop middegame.But what’s next? Now deep in the ending after 69.Kc1 white has stopped the passed c,d pawns. How do you assess the position? Kiss,Peter won with 5.5/6 after grinding down the top seed in a long endinging(Exchange Spanish I think). Polyik, Peter and Pasztor, Flora also did very well. Peter was up 3 clear pawns in a completely winning position before conceding a draw in a rook ending. Here are the final Rd6 standings. I won my last two games to finish with 4.5/6 but I could not recover from my rd1 loss and my rd2 pairing was with an unrated players that was the end of my tournament effectively. Here is my Rd6 game. Warning! !-Horrible blunders(I gave away a rook then my opponent drops his queen back to me). Black’s position looks suspicious. Qh6 is out of play, the dark squares are soft and overall black is passive. What should white do? Black has just attacked the knight. What should white do? The position has turned sharp as black has just made the central break 29…e5. What should white do? I started the tournament in a hole with a first round loss and scored only 2.5/3 today. Kiss, Peter is having a good tournament. I think he has 3.5/4 now. Several juniors are having good tournaments. I’ll post the full standings when the become available. 64 players are taking part with the usual enthusiasm. This tournament I’m not having much sucess against the usual wall of juniors that usually participate. 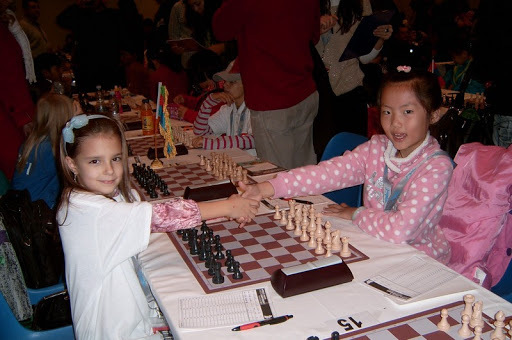 In round 2 I had this position and found the nice mate. Here is my round 4 game, which was my best effort of the day. Black has prodded the nice pawn front with 28..b5. What do you suggest for white? The attack is winding down. The kingside has been openned up with a pawn sacrifice but black suffers from playing without his queenside pieces. What do you propose for white? (more than one answer is possible). Here is my first round game which made my opponent very happy. The moral of the game is players win games not ratings! Black has just reinforced the kingside with 13..Be7. What is the plan for white now? Black thinks that after the queen moves there will be an attack on the g-file and compensation for the pawn. Another nice Budapest weekend tournament starts today. This is a typcial 90-90 6-round open with modest prizes. 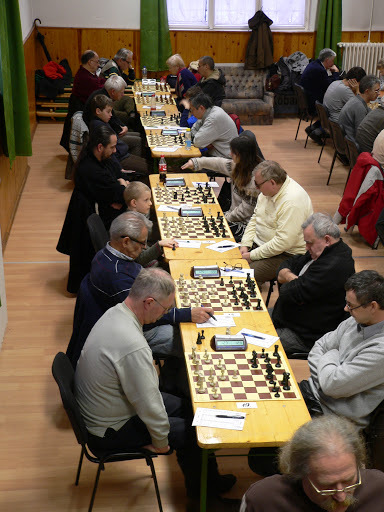 The tournament is organized by the Kobanya Sport Club KobanyaSC.hu. 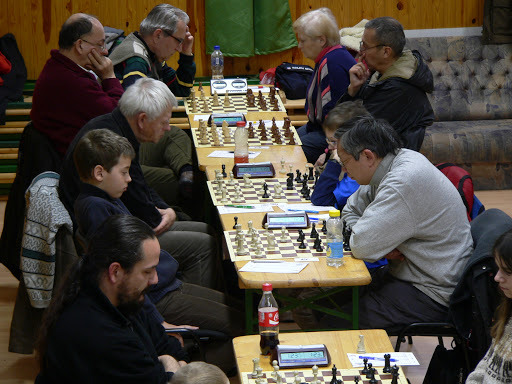 This is how Hungarian kids get introduced to chess-through clubs-and they get their initial taste of tournaments in small tournaments like these. First round later today-see you there. Hopefully someone will bring a camera. Értékszám-szerzési lehetőséget biztosítani 2200 Fide-élő pont alatti sakkozók részére. 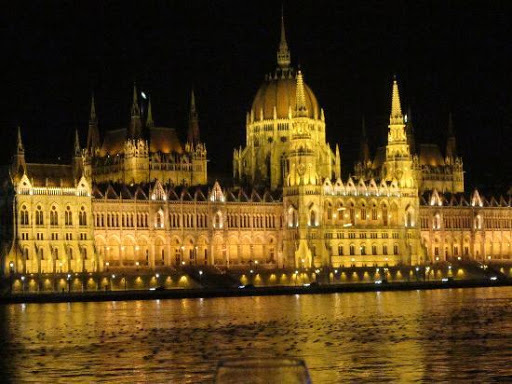 1102 Budapest, Halom utca 37/B, a Fidesz kőbányai irodaházában. Megközelítés: 28-as vagy 62-es villamossal a Blaha Lujza térről (Népszínház utcából), vagy 3-as villamossal az Örs vezér teréről a Szent László térig, onnan gyalog pár perc a Kőrösi (volt Pataky) Művelődési ház előtt elsétálva, a Halom utcán. A verseny időpontja: 2012. december 14-16. 16.-án vasárnap pedig 9 – 12, valamint 13-16 között. 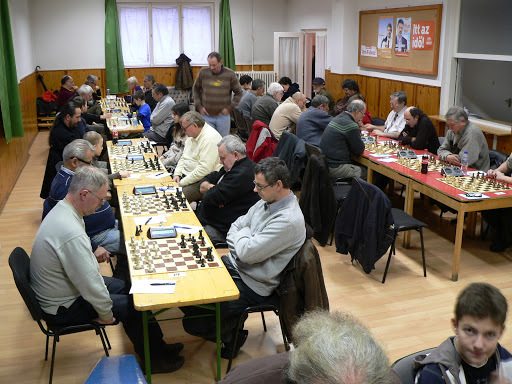 Összesen 3 óra, 2×90 perc a FIDE Quickplay Finish szabályai szerint. Határidő 2012. december 12. A nevezéseket csak a versenyterem 67 fős befogadóképességének megteltéig fogadjuk, esetleges helyszíni nevezést pedig a verseny kezdete előtt legkésőbb fél órával tudunk elfogadni, a maximális létszám eléréséig! A versenyen csak 2012-ik évre érvényes versenyengedéllyel lehet részt venni, külföldi játékos esetében pedig csak rendezett FRD esetén. 1. 12.000 Ft, 2. 7.000 Ft, 3. 5.000 Ft, a legjobb, nem díjazott ifjúsági, női, kőbányai és szenior versenyző különdíjat kap. A pénzdíjakat nem osztjuk meg. Holtversenyes helyezések eldöntése: Buchholz, progresszív, egymás elleni.